To be a mother is a wonderful experience, but full of fears and uncertainties, and when you have twins, such fears multiply. Taking care for a baby as mother is not easy, you have to adapt to your schedule, interpreting her tears, care, and understand what is best for that little being. These activities get doubled when for the mothers of twins and the starting some days can become a mess. If you are mothers of twins, do not get panic, keep calm and get ready for the most wonderful adventure of your life by following these simple tips. It is normal for the first few days that you can not distinguish one from the other. When the time passes, mothers of twins start identifying perfectly, but before that day arrives, you should put some distinctive element to your children. It is important to recognize who you fed to, and so on. You can put them in different clothing or an accessory till the time you have difficulty recognizing them. It is easy to forget or confuse about the thing you do with your babies when you are mothers of twins. Keep track in a notebook where you write what each baby ate, how much baby slept, how many diapers soiled, the appearance of the stools of each baby or the time you take medicine if you are sick. It is also important to keep a record of your babies’ behavior to detect behavioral patterns. When you have two small children at home, you need you establish routines, not only for the children, but for you as well. Rearrange your schedule and do not overload yourself with work, handling two children or babies is already a heavy load, so you should delegate the less important activities to help you care for your babies. Taking care for the two babies at the same time can make the mother crazy, especially in the early days or if you have become mother first time. It will be necessary to have someone to support the mother who can attend one of the babies while the mother cares for the other one. If the mothers of twins generate enough milk to feed two babies, you could breastfeed your both the babies at the same time placing one baby in each breast. This will save your time as well. 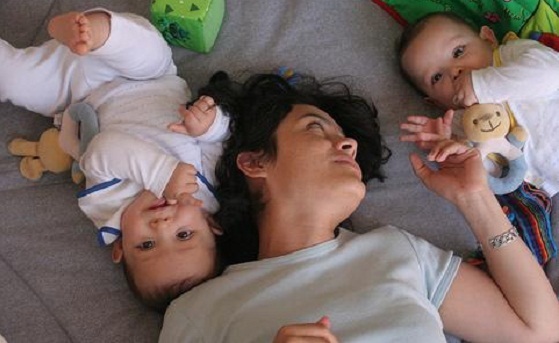 Caring for your economy is another aspect to keep in mind when you are a mother of twins. You can save if you breastfeed rather than using bottle milk or feed them homemade stuffs (suitable for babies) instead of buying already prepared and packaged stuff. No need to buy a lot of clothes, especially in the first few months because babies grow very fast and those will be useless. Visit other parents of twins to learn from their experience. Talking to someone who already has experience handing twins can be very helpful and can save you experiencing hard time what you might face because of the lack of experience. The parents of twins can advise you on issues like buying the best stroller or crib, and so on. Do not try to do everything perfectly, because no body does it. You can learn from your experience and do not repeat the same mistake, and where you have doubt that involves great risk, please discuss with your family and partner. It is important to stay stress free so you can take care of your baby in the best way. If you feel you are tensed in daily activities take a moment to breathe and relax. Only a happy mother can handle their children in the best way.